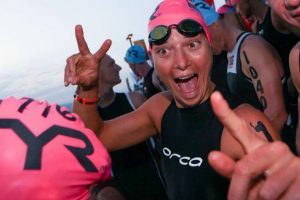 Ironman Champion Felicity Joyce on the power of mindset in racing, coaching and getting back to racing shape after injury. 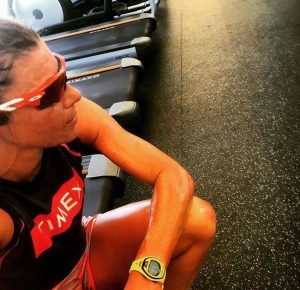 Today on Doc On the Run Podcast we are talking with elite triathlete and Team Timex member Felicity Joyce. 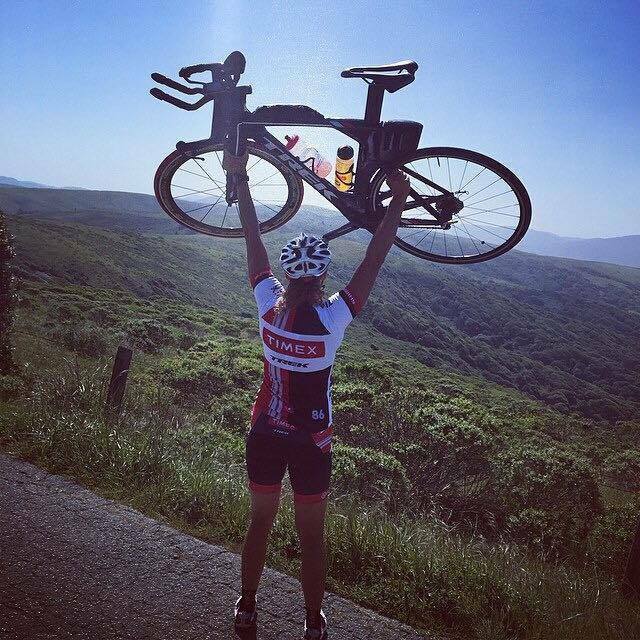 She is a well known endurance athlete from Australia. 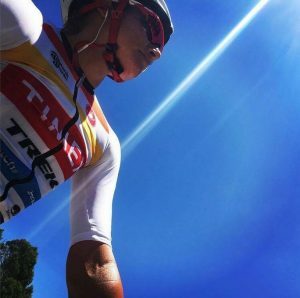 She’s currently living in training in California and she first made a name for herself in the endurance arena back in her early 20s when she became the youngest female to win the Australian National 24-hour Track Championships clocking up over a hundred miles. She also earned the young Australia Rising Star Award from Athletics Australia and Sports Person of the Year. Felicity is not only a phenomenal athlete, she’s also somewhat familiar with injuries. Early in her career she actually had a terrible bike crash when a handle bar went through her knee and pedal through her foot and that left her almost crippled at the time, unable to walk for weeks with a fractured leg. 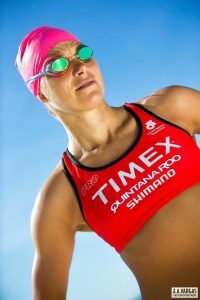 Yet she was still able to place in the top 10 in Half-Ironman and Ironman races in 2011 and 2012 and she qualified for the World Championships in the 70.3 Ironman Championships in 2011 and 2012. 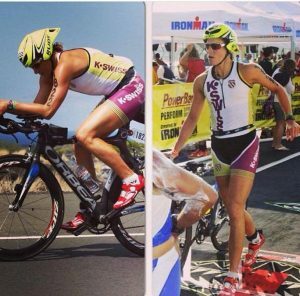 Then in August 2012 she won at her age group and she qualified for Kona when racing at Ironman Louisville, which is not an easy race. During all this stuff of course, she has like most hard charging athlete, she’s been studying full time for the Sports Psychology degree and she’s currently coaching lots of different athletes and in training as well. Dr. Segler: Felicity, welcome! Thanks for being here and maybe you can just give everybody a little additional background on you, your athletic history and what you are doing currently. Felicity: Okay, thanks for having me. As you have gone over, the ultra running career and then I ventured into triathlon which was a quick rise through that. I played school sports at a competitive level, captained a number of teams to championships in Australia before I got into the individual sports. I’ve done my fair share of injuries throughout the sports but I always seem to manage to come back that a little bit stronger and takes something away from each and everyone of them and now I have moved into coaching, I studied extra science in Australia. That’s my passions to help make others better and the best they could be. Right now I’m working with the number of individual athletes anywhere from doing their first triathlon to competing at Kona next month. It’s a great variety and it also allows me to see the psychology that is behind the scenes working with individuals and how each one ticks very differently and what motivates them to be their best. That’s the part I really enjoyed about the coaching side of things as well. Dr. Segler: Great! In fact even this last weekend in Santa Cruz, I think one of your athletes even qualified for 70.3 World’s right? Felicity: That’s correct! Tom was in his second Half Ironman and he was up there in the top ten overall and he’s going to 70.3 World championships and all he did was think that every person in front of him was me and he wanted to chase them down. So “whatever makes him tick,” I’ve said. That’s proof that made you get that result but that was a very emotional moment because I could tell he left everything out there, when he saw me, I saw him kicking up his step and he picked up his speed. Being on someone’s journey like that is amazing and it meant the world the world to him. It was a great performance there. Also in Santa Cruz, I had twelve first timers finish their first Ironman competition. Just to see their faces and how far they have come over the last three months was very uplifting. Although I’m on crutches, things like that, it’s that will help me get through this. Dr. Segler: Great, thanks! In terms of injuries like you said, you’re on crutches now. I know that of course every athlete gets injuries and we hear the statistics that 85% of runners gets injured every year. I personally don’t believe that’s actually true. 85% of runners that I know personally don’t get injured every year but certainly everybody gets injured sooner or later. We all make mistakes, we all may be overtrained, we all have accidents. You can step in a pot hole, you can crash your bike or a car can pull out in front of you. All of that stuff happens. Everybody gets injured but it seems like last year you’re really off to a great start after having had some previous setbacks and then after this awesome start you have like a huge setback, can you tell us about what that was like? Felicity: It was probably the hardest setback I’ve had in my career to be honest. The previous year I had just come back from a fracture and then I had found my strongest and then June last year I was in a bike accident which I had no control over and ended up with a broken clavicle in multiple places and a broken elbow and off to surgery. And right then at that moment I thought I was at my peak. That one was hard enough. Then it took a lot of work to get back from the surgery. It was not textbook style; there was a lot going on in there. But I took a lot of time off and I was working back from scratch basically, all the way back. Then towards of the year and we started to turn some really big corners and find a fitness level I didn’t even know I had in me actually. We just hit that whole new level. 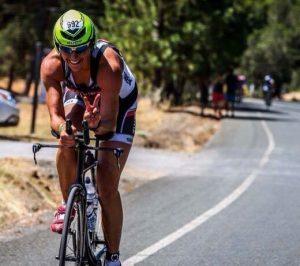 Things were clicking, it was exciting, it was like “oh that was all this has been for”….this moment now working towards the comeback race with the Vineman Ironman. It was at my birthday, it’s a local crowd, it just seemed perfect for that comeback race. So we worked super hard we had some good little wins in some shorter distances leading up to it and everything was just feeling good. I was enjoying feeling sore, the good sore, not injury sore and just really giving it my all for that day and then I got this major setback right before. Dr. Segler: That’s one of the things I wanted to talk to you about because obviously the Sports psychology, the idea that you really do understand this. You understands how to coach athletes, you’ve been coached yourself and a lot goes into that. It’s not just fitness, it’s not just drive, it’s not just motivation, It’s emotion right? That really goes into this. And I think that’s one of the big things that physicians are not taught and frequently miss in treating athletes is the emotional component of injury. Trying to not just understand emotion and how it motivates you and but how it can also affect you in recovery. Doctors really don’t talk about that stuff at all and we know that athletes are not machines. They are biological systems and those biological systems are affected by the hormones and everything that changes with all these emotions and we know that emotions effect the physiological process, they can be influenced and they can change based on all the emotions that goes into this. But what did you do? How was it that you could work through this? Because that’s the difficult thing to deal with when you’re prepared for this whole return and then it’s basically taken away from you? How did you work through that? Felicity: Even in my latest stages of the training when we were peaking for the build, I would , visualize my coach, my friends everyone out on that line and I was all set for this magical comeback because everything felt so amazing and then for the day before the race we get the MRI results then the doctor says “sit down I need to tell you.” Going from expectations of like that to being sat down in a chair and being told “Hey, you’re not racing your dream race tomorrow” was, my hair is just standing up right now, it was devastating. It was hard to accept at first. I think I didn’t want to accept it. I was going to race this race no matter what but then I sat in my car and I think I cried for a couple of hours. I didn’t talk to anyone. It really took a while to settle in and that’s okay. I think it’s okay to feel because that just means that you care. It’s okay to have a moment and it’s quite healthy to you as well. But you know what, the race was the next day and I had a lot of friends and a lot of athletes I coach racing. I should’ve been out there with them and it was hard to watch, but it was the best thing I could’ve ever done was to go up there to support them in that race. I left that day feeling like I had purpose on that day. I’d helped people chase their dreams that wasn’t mine and that really kick started the recovery straight away and the next day I was so glad. I just went up there and was there for everyone else and just showed that there was other purposes rather than me winning that race or doing well in that race. From then on, I took a couple of weeks of very much overthinking things a little bit. I keep on bringing back where I was at in my training and keep on thinking what the day could have brought but then once I was accepted things, things changed. It was all about accepting where we were now. I surrounded myself with a good team which I think is important. It’s always helped me back. I have my mentor in Meredith Kessler. She’s been a great sidekick to help me get through these injuries. My coach, my doctor, my physical therapist and the best thing about having that team is all they think about is what’s next. It’s never about where we’re at or anything else it’s alright. Okay so we’re here what we do now? and what can we do now? That starts the ball rolling into changing the mindset into “Oh my God, I have lost everything” into “Okay, how do we get from A to B” and I think having a plan, having a team and that gets way. It helps you motivate to move forward rather than just stay depressed. It can happen. Depression is huge especially when you invest so much into it. It’s your everything and you work so hard for it that it is a huge blow when something like this happens. It’s important to surround yourself with people that can lift you up and keep you moving forward rather than just stagnant for any amount of time because the longer that is, the harder it is and the more the mind thinks and the more you get in that negative stage. It’s how can you turn it into a positive mental attitude as quick as you can. For me it is writing out a plan and see where we’re going be in a couple of months. What can do this week to lead to that next week and doing the little things. But it’s definitely, I’m going to be honest and saying that it’s a very hard mental path for anyone that’s gone from peaking to crutches or in surgery or anything like that. It’s a huge battle with the mind mostly than anything. Dr Segler: Yes, it’s not easy. That’s just it right? These things happen. It happens in all aspects of life. Some things are really not that big of a deal. Some things are a big deal and non-athletic people don’t really understand. They say “Well okay, you didn’t get to race on your birthday”. Well it’s not really what that means, that means something else to you. It means something else to people that really put some effort into because it’s the same thing like we visualize these things. All the races I’ve trained for I am visualizing exactly what my goal is, how i’m going to accomplish it, what it’s going to be on race day and when you train for Ironman. That leaves you a lot of time to train and think about these things. You had probably, I would imagined, have visualized how that day was going to go for hundreds of hours and then it didn’t go that way. It’s not like you showed up and they were out of some particular thing at the grocery store. This is at different thing altogether. Felicity: For me also personally coming back from my previous crash. A lot of me wanted to be out there and wanted to show my team who would got me, my doctors that understood, my coach that understood, my mentors, my friends that stood by me through thick and thin because they’re the ones that really helped. For me, getting back there and showing them an amazing race would’ve been like it was all worth it. Thank you, thank you for staying with me because this is what we have gotten through, this is the result of it. When that didn’t happen because I also felt I’m letting down the team. I’m letting down everyone who invested so much time for me to get to this place and now I can’t deliver. There’s a lot of weight on my shoulders because obviously you want to give back to those people that stood by me. That was another mental thing I really struggled with that I wasn’t able to deliver after they stood by me all this time, to get me to that stage. Because it’s not really just an individual sport. There’s a lot of people even your family sacrificed a lot for you to get there. 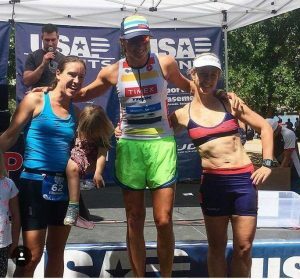 Definitely, it’s that aspect and then you get the injury and then you realize people are there for you because you’re you…not because you’re a great triathlete and that in itself is something you can grab and for me I didn’t realized how much support I had until the injury happened. And it happened again and I’m like “Okay, once, fair enough. Everyone’s very caring and everything but again how many people are really going to be there? They’ve heard this before, right?” There was even more support and you are like “Wow, this means you’re doing something right in life.” That was a good take away for me that, okay I didn’t have my race but because of that, I realized I had so many people that will be a part of my journey. That didn’t matter if I won that race or not. That was one of the take aways but definitely it’s a hard path and it’s redirecting those thoughts. Just to be grateful for all the things and redirected on “Okay, it’s gone”, but now that race will pass. But now you’ve got to just, “How do you get from A to B and get back as quick as you can”. Dr. Segler: Like you said, you were able to have this sort of some of the same things that people go through like the stages of grief. There’s anger, you go through denial and when you go through this things and finally get this point of acceptance and then you start to moving forward. You went through all that and then you were able though to do what’s necessary. This is key for any athletes, this is all mindset. You have to realize “Okay, well if you go to Mexico and drink the water before Ironman Cozumel, your day is not gonna go the way you planned”. Dr. Segler: You have to be able to redirect and most athletes have sort of a Plan A that they have really wanted and plan on but then they also have a Plan B for “Well, if it rains and I don’t ride as fast in the rain or if it’s windy and I don’t ride as fast in the wind, what am I going to do then?” Because you can’t just assume, “I’m going to go five hours on a bike.” You have to have a Plan B and realize, everybody else is having their own race and they’re doing their own thing and they probably or not on Plan A if I’m on Plan B. But it’s all mind set right? And that is the same thing for recovery. You can’t start to get better until you know you have a problem and you have to fix it. You have to shift your mindset in the same way you have to shift in the race. Don’t you, when you get injured you have to shift your mindset so just focusing on recovery. Felicity: It is and it’s all about for me, I had to switch off from everyone else’s journey. I had to zoom in on mine because once I saw what everyone else was doing mentally, it’s like I want to be doing that. I should be out there doing that with because in this community most of our friends are athletes. Felicity: We see them doing it. Mentally, you’re stuck in bed or whatever and they’re all out doing it. Weekend ride and you’re just like “I want to do that, I should be out there, it’s not fair”. All those things go through your head but once you dial in and just focus on your journey and it’s so important in the rawl stages because it gets out the negative of what you could be doing and to what you should be doing. Then it is really about celebrating the little victories like getting my arm over my head became the biggest day of my life. I felt like I just won an Ironman and I posted a picture of me winning the Ironman that happened on the exact date that I was able to lift my arm over my head but on those two days I felt just as a big of an achievement. I focused on being better than the day before or being better than the week before in that injury, I think rather than comparing it to when I won that Ironman. I think it’s comparing small progresses like the progress so important to celebrate that and share it. Share it with people because you don’t know who you’re inspiring. I’ve got that many more emails and messages from people that have followed my recovery, that have followed my Ironman win and it was like there are other people out there struggling with this stuff and if you use that positive through, it can inspire them. They saw my crutches at the pool, “Alright I’m going to get in the pool at once because I really should swim and she’s there with her crutches. I’m going with this.” I think getting that mindset around, stay focused in your journey, not others and also celebrating little victories where you are not where you were and it gets you there. But definitely you have to do little things every single day whether that’s toe touch or trying to lift your arm over your head. Doing the little things lead to the big things and I have always got back so much faster and back to my full self and even stronger by doing that rather than waiting to “I’m fully recovered and then, okay well I’m fit now, I’ll start working out. I’m okay to train. I’ll stop.” But the mental part of that also because it is not your sweat session, it’s not your anything but knowing that it will lead to something and just celebrate in a small progress keeps you motivated to do that. Dr. Segler: That’s a common thing with athletes, like wanting to look your best, right? TO think “You don’t want to go out with the group ride until you’re able to go as fast as you were before”. When I raced motorcycles, many times, several times a year I would go to central Texas and rent this race track all by myself so I could practice by myself for the entire day. So I’d be prepared to look as good as I wanted to look when the season started. And you can’t afford to do that as an injured athlete. Because the season is moving and everybody is going to their own progression and you can’t expect your position on that progression to be equal with people you used to train with. You just can’t right? You have to be prepared to shift that when you have to. Felicity: You definitely have to shift the mindset and be on your own path until you can get there. Then comes the next stage when you are back training and everything seems so tough not because you’re injured but because you have been injured and you have to work back through and this mindset of if I’m ever going to get back to where I was, back where you were and it’s that parts a whole new ballgame, after the injury stage of the rehab. But it’s again focusing on progressing where you are and having goals like “Signup”. Having a race in the distance that you’re working for knowing this thing will led to the next. If you really want something, you should do it and then you’ll get there and to tell you the truth when I was peaking for Vineman, when I was doing my hard workout, I had so much things to look back, hard times, going back from the previous injury that actually got me through the workouts. I was just so grateful to be out there where everyone else was like “I can’t wait for this Ironman to be over” and I was just In-love with it and some of that it leaves you. Also when you race, you’re more grateful, you’ve got things to think back on and I think that’s where the mindset helps. Science can take you so far with training but having things to draw on that you’ve been through and experienced that can just take you the whole new level. Dr. Segler: That’s great. During these episodes when you got injuries, what did you do? Because I know that rest is probably the most unutilized resource for every triathlete and particularly long distance endurance athletes because there’s so much to do. There’s so much to train for and the fastest Ironman I ever had was after I got sick. Dr. Segler: Which is like classic, you read about these things all the time when somebody gets really sick and then they have their fastest race ever when they don’t know even know from the start because they finally had some rest because it was forced. Dr. Segler: And we’re not great at that right? What did you do? Because in some ways with an injury it can be easier because you’re forced to rest. If you’re in a hospital bed, you just had surgery, you’re really not going to be doing a lot of workout. But it’s tough to rest. Right? Felicity: Right, it’s so tough on that. To be honest I find it the toughest. I’m not a good rester, at all. I am usually going 24/7 but that was one of the things we changed in this Ironman coming back. After the previous injury was incorporating more rest, then the results were phenomenal like just the performance and the next level that I got to was due to to trying to get a better night sleep, trying to declutter. That kind of thing would give me more time to recover but rest after injury, it’s a little harder than people think. People think “Oh you’re in bed and that you’re resting” but if you’re in pain that’s not true rest. I struggled with that a little bit because one, I couldn’t do too much plus I didn’t feel rested. I didn’t feel like because I was in pain or what not and in your mind’s also not rested because you feel like you should be at the training or whatever. But I knew how important it was after I hadn’t done it in one of my other injuries and then I did do rest and ten weeks later on my comeback I won in Kentucky. But to incorporate more rest is tough. Usually at 5:30 I am in the pool with my mates doing the things. Instead of that, I would try sleep in, go to my gym pool later in the day, do my pull workout because I can’t kick and definitely just taking yourself out of that. For a little while, there’s no reason I had to be at the 5:30 pool session. I could go to my gym at noon and do my workout at lunch and just try to get more sleep that way. Trying not to fill my days, 24/7 running around, taking more time to just come back, relax and chill and try to take a nap, I’m really bad at naps. But it is good but trying to get to bed earlier. I think you don’t think you need as much rest because you’re not doing as much but your body really needs rest to deal with injury because it can make you really tired. You definitely sleep, sleep, sleep as much as possible. I think the shift in training as well, even though you can do something, sometimes and you don’t have to do them five AM in the morning when you’re injured, you can sleep in. And as triathletes that is just hard for us. We are used to schedule, schedule, schedule. I’m always at that 5:30 swim. But you’re injured. Sleep in, go at noon. And it is not as motivating, but until you get around into that stage then it’s alright get back to work but definitely shifting the schedule helped a little bit. Dr. Segler: Did you anything to shift your nutrition as well or was it pretty much the same? What did you change of anything? Felicity: I think if anything, I learned from some previous injuries that you need to keep up enough for healing. A lot of us are type A and we’re like alight I don’t have training, I’m not going to eat too much. I don’t want to balloon up or whatever and we get that mindset. What I’ve learned is that healing takes a lot of nutrition to get you back quick. If you skimp on that, it’s going to take you that longer. The quicker you can get back to your A game, the quicker you can really get back to your fitness and in shape. If you fluff it because your injury takes too long because you didn’t have the right nutrition, it’s going to take even longer to get back in shape. Just do it right from the start and make sure you have enough calories. Get more protein, not as much carbs. I actually use bone broth. I made a ton of bone broth soup. It’s so good for you and especially with the healing of bones and other injuries. Hydrating a ton even though we are not training. You can never go wrong there and trying to eat pretty clean because even though we’re not training, sometimes people comfort right off the ball. How do you eat a salad when your training eight hours a day and then you’re not taining and then you just eat whatever you like? It is like we’re switched on or we are switched off. But I think the more you can stay more switched on and not let it go too much because you want to keep the inflammatory down. And good food is healing food so the more healing environment you can get. But it’s hard, it’s harder than when you’re training hard and focused. You see a lot of people fall off the ball there and I think the more clean food you can have, it really helps the healing. Dr. Segler: I see a lot of athletes that they do exactly what you said. It’s one of two things. They either say “Well, I’m not training. I’m not burning the calories and I need to cut back on the sugar” and reduce total calorie intake so they don’t just suddenly balloon up sitting on the couch. Or, they do the exact opposite where they say, “What difference does it make? I’m not training now. I can do what I want like it’s the offseason.” It’s not complicated right? You have to have these nutrients to rebuild any kind of tissue. As an analogy I remember a friend of mine who is a construction worker. He was working at this building, a residential home, he’s building a house and he said they were behind schedule. Why are you behind schedule? We’re waiting on sand. What do you mean wait on sand? We have to lay the foundation, we are literally waiting on sand. We have to have a sand before we can have the foundation, we’ve already got all the other materials there. We’ve got piles and piles of wood that were delivered already. All the guys that are supposed to be framing the house, they are all waiting on sand. And you don’t want you body waiting on sand right? If you don’t have whatever nutrient it is that your body needs to rebuild that tissue, you’re waiting and you’re going to wait and wait until you get it. You can’t make it appear miraculously. Your body is not going to rebuild broken bones or torn tendons or muscle strains or anything else eating pizza and potato chips. It’s going to work a lot faster if you get the proper nutrients, you just need to do ways about it. It’s so fascinating though because I think it’s true as athletes we’re sort of told “Okay well look the season’s over. You have an off season. Try to not wear you heart rate monitor for one day.” We don’t want to do that. We take the opposite approach and it’s so polar sometimes. But it’s very difficult to not do. I know it’s tough but when you’re finally on these episodes, you’ve been injured and you’re getting back to recovery. I still remember, that was over 20 years ago. I still remember, that’s the dumbest thing I have ever heard because if anything that I’m doing that I consider training isn’t painful, I’m not doing it correctly. I’m not trying hard enough. I thought “What does it mean?” The only time I’m not in pain is when I am asleep. I didn’t understand that. So many doctors who treat athletes will say “Well just go walk around or something.” They have no idea of what to tell you do. But you need to be deliberate because if you have one particular, a broken leg, a broken foot, a collarbone, whatever, you have to strengthen everything else. If you’re going to start swimming and you broke your collarbone but your other arms are really strong and your legs are really strong. It’s a lot easier to bring that gimpy arm along right? That’s the thing, how do you do that? What have you done? What would you tell your athletes if did they get injured? Felicity: My focus has always been on what we can do, not what we can’t do. Don’t even think about what you can’t do. Alright you’ve got your arms. Let’s go, okay. It’s always been everyday right now I’m on crutches, I’m in the pool pulling. I’m at physical therapy doing core work and upper body strength to keep working on my clavicle and to keep that balance but I have always been able, when the doctor gives me the next step, be able to take that in full stride. You can either let yourself go and just wait and wait and then you’re going to be starting from scratch when he says “Okay you’re completely healed” and then that could be another two or three months of rebuilding the whole system. I’ve always come back stronger by focusing on what you can do and I give my athletes that advice as welI. I have had two athlete’s come back from hip surgeries, one from a spine injury. They’ve come to me and they got back strong but they didn’t sit around and wait for it to get healed. There’s plenty you can do and some people might be conservative when say that you shouldn’t do anything but I feel I’ve got a broken foot there’s no reason you can’t do anything without the body. Dr. Segler: It’s true and if you think about the way the doctor sort of seemed to teach us they want us to say “Okay well if you rest, you’ll recover” and they think that they are mutually exclusive. But if that were true and when you ended a six hour ride on saturday, when you couldn’t do anything else for several days because it would take several days for you to actually recover those muscle groups that have been worked the hardest. But the fact is, you can do something the next day and recover those other parts of your body. You can do two things at once. You just can’t do too much. Obviously, if you’re rebuilding the collarbone, you really can’t run twenty miles a day and expect to rebuild all of the tissue damage you deliberately caused with your run and the big trauma that you’re trying to recover from. We can do both but there is a balance right? Felicity: There is definitely a balance and it also helps motivate the athlete and it helped myself as well and my other athletes by focusing on what we can do mentally as well. Doing something so you can see that you’re progressing in something that is huge when you’re injured rather than not being able to do anything. Just even being able to get a stronger core or being able to do more with your upper body or pull a bit further in the pool. It’s just some more motivating than not doing anything. Apart from that it is really going to help you get back and get some cardio and keep you healthy. But it helps you get stay switched on in other areas too because you’re feeling like a bit of an athlete still right? You’re still working towards a goal rather than just “let go of everything and I’m just gonna sit here”. But you don’t want to overdo it. I know with after my clavicle I’m pulling in the pool now, but I don’t want to overdo it and play that up either. It’s just enough to get and I think blood flow is amazing for the body and for the brain, everything. When I did my clavicle I went out hiking with people that I couldn’t run with because when I was in training I had to stay in my heart rate. I just stayed in my pace. I was not going to walk with like jog. But it build friendships because we hiked for hours. 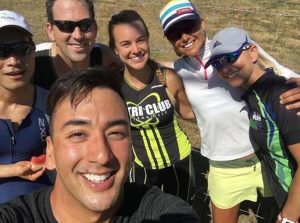 I regrouped with people and you might have to ride slow so you’ve got riders, running with your friends you don’t usually get to ride with and that was really helpful, too. But I think doing that little things everyday will lead to you getting back faster and stronger and in a long run you don’t have time to those little things when you’re training for Ironman. You got to swim, you got to bike, you got to run and how do you have time to do strengthening all this little thoughts as well. Take the time to do all that stuff you don’t have time for. You can really utilize the time a ton. I think it’s about being smart like that. Dr. Segler: Well that’s one of things like the old sort of things about smart goals being specific, measurable and attainable right? When you get injured, sure you could go five hours on a bike, no problem right? But now you can’t, you’ve been injured. So you have to set goals that are attainable and it also works right? You can say “okay so well I’m going to go at this pace at this race and if that goes well then I’ll go this much faster as the next one”. If you don’t achieve that goal, psychologically it makes it very difficult for you to achieve your next goal right? I imagine with coaching, you have to talk a lot with your athletes about like “Okay what do you want to do and what are the goals that we can set”, like you achieve one goal after another to get you to that end goal like Tom qualifying for World’s. He didn’t do it in this first go right? It’s not a new thing for him. He’s been, I would imagine, racing for a while and working toward that goal, but achieving lots of smaller goals along the way. Felicity: That’s super important with the recovery from injury. I sat down the week after this and I wrote out. Alright this week, I’m on crutches. This week I’m on crutches but pulling in the pool. 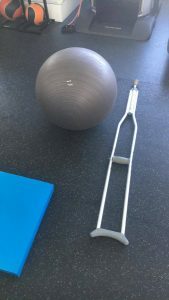 This week I’m on crutches with pulling in the pool and adding some core work. This week I’m going back to doctors and see if I can get off crutches and in 8 weeks time, I saw, I’m back on my bike and I’m back starting, kicking the pool. I’m like “Okay we’re here. We’re almost to this week and we’re almost that week and we’re almost this week and this week sooner I will be on my bike. I try to do that with my athletes too…so they could see where it’s going to end up. When you’re in the moment, “Oh wow, I can pool for thirty minutes in the pool.” Okay if i do this, this week, in a few weeks I’ll be doing okay then. I think it’s having a little goal but also seeing why you would be down the road and knowing that you’re going to get back there and if these things will lead to that. I think definitely having goals to get back and seeing that. Seeing where you’re going to progress to and also but knowing that you might have to take some side roads depending on the progress but I just think those steps are huge to be able to see for the athlete. Dr. Segler: Right, that’s great! Sooner or later one of your athletes is going to be injured right? What if there was one piece of advice is you could give them? For the people listening, what is the one piece of advice you would give them when they’ve been injured and if they have some big setback? They know that they’re not going to do their key race. They know that they’re not just going to be able to accomplish what they wanted this week. What do you tell them? Felicity: I tell them what I think is that, what really helped me, is that everyday is a day we don’t get back. And so however you want to treat the next day is up to you. We can start working on the next goal all or we can just stay here. One day in this whole year isn’t everything. It’s your journey. Some of my athletes didn’t race, and I was most proud of them. If you just focus on that one day which is that race, and you forget about the other 364 days, you’re missing a whole year. You’re really are. You’re missing a whole year because that one day and if that one day doesn’t come, it doesn’t mean that you don’t celebrate how far you’ve come that whole year. It makes so much great ground that you’ve had some amazing training days. Stronger than they ever thought they could be and that doesn’t just go away. Just because they didn’t race line that doesn’t mean they didn’t do amazing things all year that they shouldn’t be proud of. And they quickly forget about those things. They forget about the other 364 amazing days they had once that one day goes and I know it’s tough but just re-emphasizing how all the positives that have come along in the way. I think that’s really key and be supportive. Just set the next goal and show them what they can go from there. I definitely think, just focusing on when you change that thought to “Okay, I’m not going to get this day back, so let’s make the most of every single day”. Making the most of everyday and just always working on the little things just makes a huge difference. Felicity: Right. Good luck with it all. I’m coming back too. Thank you. Dr. Segler: Alright, we can’t wait to see what happens next with you as soon as you’re off the crutches and getting back at it. Thanks Felicity. Felicity: I think we all write the best story ever! Dr. Segler: Somehow I imagine you have a plan for that. Felicity: I have a plan!